Should I be worried if I see my cat drooling a lot? The answer to the question is – yes and no. Fear not, salivation is normal in animals (including cats); however, excessive drooling can be an early sign of your pet’s failing health. Sometimes, you will not notice your drooling cat unless you look closely. For a cat lover like myself, I always pay attention to my cat’s health, and I always check tiny health-related details such as the texture and smell of her drool from time to time to make sure that she is healthy and comfortable. One way to diagnose a cat drooling problem is to check the texture and smell of the saliva. Hypersalivation is the term used to describe excessive saliva production which is mainly caused by different stimuli coming from the environment. But why do cats drool? Continue reading and you’ll find out. Is your furry baby feeling stressed out? This might be one of the few reasons your cat is drooling. It is essential to diagnose this scenario as stress can weaken the cat’s immune system and can lead to serious health problems. Stress çan also cause discomfort and can lead to drooling. How will you prevent your cat from becoming stressed out? Give your cat a comfortable and clean environment that’s also peaceful. Make as little changes on the cat’s living environment as possible, and if you plan to bring another cat into the house, always make sure you keep her in a separate room for almost two weeks so that your original cat first gets used to the new one’s smell. Feline odontoclastic resorptive lesion (FORL) is one of the leading causes of dental problems in cats, which results in excessive drooling and oral pain. FORL is painful for your cat so find a way to soothe her. The thick tartar and unhealthy gums can also lead to bad breath which can result in excessive salivation. (You should learn how to brush your cat’s teeth properly) 85% of cats over three years are experiencing teeth and gum problems. (which is an alarming rate) It is highly recommended that you care for your pet’s oral health to prevent other health issues from arising. Health conditions like oral cancer and respiratory diseases can also be the reason why your cat is drooling excessively. 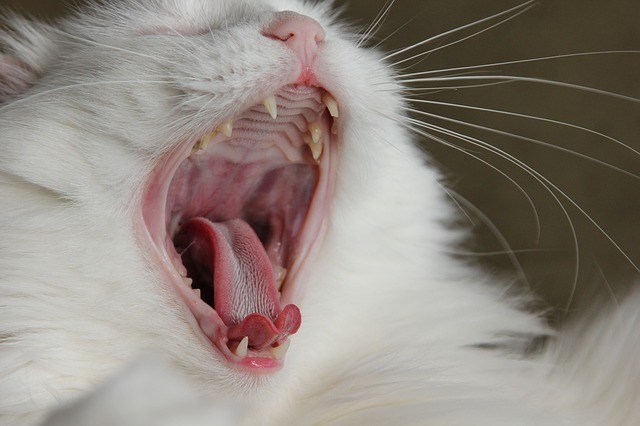 Due to poor oral health, your cat may develop oral cancer which can occur from the tip of the tongue to the back of the throat which can lead to salivation and bad breath. A viral respiratory condition can cause ulcerations and increase the production of saliva. With serious health issues like cancer of any form, you are strongly advised to seek your vet’s help. The intake of foreign bodies is another reason why there is an increase in saliva flow in your cat’s mouth. (You cannot avoid this situation as your inquisitive furry baby can be curious by nature) Swallowing at this point can be uncomfortable for your cat and can also lead to saliva buildup and drooling. Foreign bodies take 24 hours to move to the digestive tract and can also cause an obstruction which is very dangerous to your cat’s health. They can also cause a lot of discomfort, which can add to the reasons why your cat keeps drooling a lot. Being in contact with toxic plants can also cause drooling in cats as it contains insoluble calcium oxalate crystals which can lead to a burning sensation in the mouth. (Insoluble calcium oxalate can cause drooling) Stay away from poisonous plants! (such as umbrella plants, calla lilies, peace lilies, etc.) Cats can get poisoned by nibbling on the leaves of such plants – and even tulips are dangerous, so check out this list of toxic and non-toxic plants by the ASPCA. So, is it normal for cats to drool? Yes, it is normal for cats to drool but not excessively. Your cat drools when happy, so naturally, your cat drools when pet. That’s why you will notice that your cat’s drooling when purring. Cats also drool due to health conditions such as oral cancer and respiratory health issues which can increase saliva production. Poisoning can be another reason for your cat drooling. The best thing to do to prevent your pet from going through abnormal drooling is to always keep tabs on their health at all times. And the most important thing you should remember when you see a cat drooling excessively is to discover the reason as soon as possible. The texture and smell of your cat’s drool can tell you about your cat’s condition. It is important to learn to make the difference between the moments where your cat is happy and drooling because you’re petting her and a situation where drooling can be a symptom of a medical condition. Your cat shouldn’t drool if you aren’t petting her or if no appetizing meal has been presented to her. My own feline buddy starts drooling like a dog whenever mealtime comes around and that’s something I’ve had to get used to because I hadn’t encountered it in other cats before. If you enjoyed this post, maybe you’d like to find out more about feline eye infections.